AFTER HAVING MISSION’S mighty SX5s in my living room for a couple of months (reviewed here), it seemed a strange notion following those large floorstanders with the wee Performa 3 M105 standmounts from Revel. But where the SX5s were possibly a touch too big for my room (at least appearance-wise) the Revels, as I was about to find out, were not out of their depth in any form. Whether you like to call them “bookshelf” or “standmount “speakers, there is a staggering amount of choice when it comes to buying small loudspeakers, and there’s almost an equal range of prices. 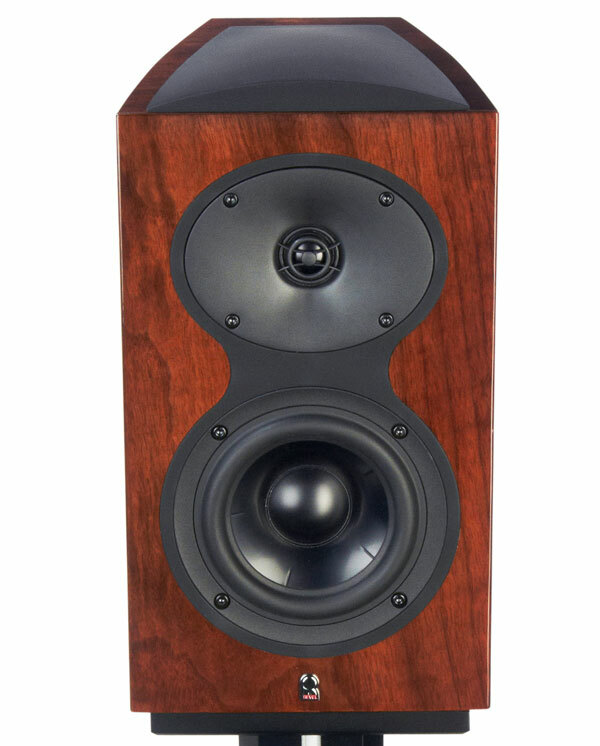 The new ‘Performa 3’ M105s sit in the mid-to-high end of the scale, but for Revel – better known for costly high-end floorstanders – these are an entry-level speaker. Revel is an American company that is under the Harman Luxury Products Group umbrella, and thus share a bed with the likes of Levinson, Lexicon and JBL. In fact, Revel speakers are intended to compliment Levinson products, and Tom Davidson from New Zealand distributors Orange Road told me the Performa series are made specifically for the Levinson No. 531H, 532H, 533H, and 535H line of amplifiers. He says they are intended to sound close to the Ultima2 speaker range, and are designed to be neutral sounding, as opposed to warm. There is an M106 available which is slightly bigger than the M105, and slightly easier to drive, as well as two centres, two subwoofers, a surround-channel speaker and two floorstanders; the F208 and F206, which Tom says has the same design philosophy and finish as the M105 at $6500. 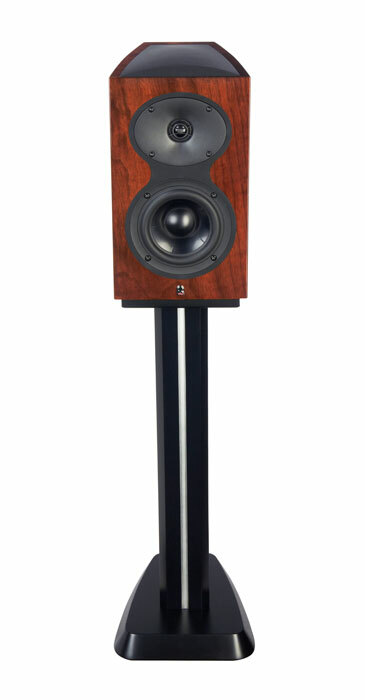 Available in piano black, piano white and high gloss walnut, the M105 is a 2-way, rear ported bass reflex standmount speaker, with a 5 ¼-inch mid/bass driver in a cast frame and a 1-inch aluminium dome tweeter. The tweeter is fitted with an acoustic lens waveguide, which is designed to give smooth off-axis sound and greater dispersion of sound at higher frequencies. This is certainly an interesting feature, as it’s not always possible – or sociable – to sit dead centre between your speakers and still get a good level of enjoyment. The mid/bass drivers use distortion reduction mechanisms to insure low distortion even at high volume levels, and the cast aluminium frames help reduce unwanted resonances which can disturb the sound quality. Revel carefully select high quality components for their high-order crossovers in order to give the best and most accurate sound possible. The rear mounted bass port has identical flares on both ends to greatly minimise “dynamic compression and port-generated noise”. The cabinets – said to be similar to Revel’s flagship Ultima2 speakers – are made from 1- inch thick layered-wood panels which curve from front to back, perhaps not quite as gracefully as, say, Mission or Wharfedale speakers but it’s nicely done all the same. The high gloss finishes are said to be overseen by Italian luxury cabinet makers, though possibly slightly less glamorously, the speakers are made in Indonesia. The review sample came in high-gloss walnut which looks very nice indeed, though I did notice a small blemish in the finish on the front of one – surely a one-off? The M105s are solidly built and giving them the old knuckle-tap test proved that they are well braced indeed. They measure 356 x 200 x 248 mm HWD and weigh a fairly decent 7.2kg, and you’ll need good sturdy stands which are tall enough to put the tweeters at eye/ear level when seated. Sensitivity is said to be 86dB and nominal impedance 8 ohms, with recommended amplifier power at around 50 to 120 watts, so yes, they do like a bit of grunt driving them. The low frequency extension is given in the manual to be 44Hz (-10dB); 56Hz (-6dB); 60Hz (-3dB) and the drivers cross over at 2.3 kHz. Magnetic covers are provided and though they are designed to give clear, un-veiled sound when in place, I preferred them off; for sound and looks. Each speaker has one pair of good quality gold plated binding posts, so it has to be single runs of speaker cable only, sorry tweakers. Fixed to the top of the cabinets is a rounded “cap” – a kind of rubberised material which matches with the grilles when they’re in place. Whether this is purely aesthetic or adds to the resonance damping, I’m not sure, but it does attract finger prints and other marks, so beware. On paper and in the flesh these speakers look pretty darn good, but all the design innovations and measurements in the world mean absolute diddly if the finished product doesn’t sound good, so without further fluffing about, I set about seeing what they could do. I knew the Revels were fresh off the boat and had not yet seen any current, but even so I was rather unimpressed when I first played some music through them. I thought the sound seemed bland and uninvolving, with no real distinguishing features; but of course I knew I had to persevere and get some hours run into them, so leaving them going with the CD player on repeat with the likes of Pitch Black did the trick. I usually find I notice improvements after 20 to 50 hours, with a good 100 hours being a good point to call speakers run-in, but while I did start to notice gradual improvements over time, I’m sure I went well over the 100 hour mark and unfortunately lost count before I felt they were ready to go. I don’t think this is necessarily unusual, but it did seem to take a lot of running-in before I really warmed to the M105s. But rest assured, I did indeed warm to them. My Unison Research hybrid integrated provided an ample 130wpc (I didn’t have any Levinson amplifiers on hand, unfortunately) with my Well Tempered turntable almost exclusively on music duties. I placed the Revels on my old pair of solid-metal spiked stands and tried them in many positions before settling on a spot, slightly toed in towards the main listening position. Part of this is going to come down to personal taste as well as space limitations, but I really do recommend you spend time getting positioning right because it can make a big difference to the listening experience. Toeing in is sometimes necessary, to varying degrees, to really focus that soundstage. Two things immediately (that is: after they were sufficiently run-in) struck me with the Revels. Firstly, that the central image in particular was really quite something. It hung in the air between, behind and in front of the speakers, with nice detail levels and a real strong sense of perspective. Secondly, the little standmounts were incredibly efficient at filling the room with smooth, full-bodied sound and fooling me into thinking they were bigger than they actually are. The M105s have a seriously big sound with a near life-size scale – certainly not what I had been expecting. Another thing I noticed was that while they don’t go particularly low in terms of room-shaking, trouser- blasting bass, they can certainly do a fine job of following a bassline and throwing it out in a tuneful manner. The bass can sound rich, mostly from the upper-mid bass range, though at times I would have liked it to be a bit punchier, and more rhythmic. Yet while you may wish to add a subwoofer to get that really rhythmic low-end drive and energy, I found there was still plenty of enjoyment to be had, and you’d be expecting a lot wanting tremendous bottom end from cabinets and drivers of this size. T-Bone Burnett’s scandalously overlooked self-titled LP from 1986 is an incredibly good recording featuring beautiful sounding acoustic guitars and sumptuous bass lines which accompany Burnett’s superbly recorded vocals. Here the Revels really shined and the first track ‘River Of Love’ sounded glorious with its shimmering acoustic guitars, while the bass sounded truly lovely, providing a good bed for the rest of the instruments without overshadowing them at all. Burnett’s voice was suspended in the centre, sounding remarkably lifelike and soulful. The tweeters sounded good, never breaking up, even with the highest notes and the acoustic lens waveguide really did seem to disperse the sound smoothly, sounding very good when sitting outside the sweet spot. With Count Basie’s 1975 Basie Jam LP, brass and piano showed good timbre and colour but Louie Bellson’s drum solo at the end of ‘Red Bank Blues’ seemed a little bit distant and, I’d venture, languid, though I noted the bass drum had good tone and reverb. I found this to be the case with several other jazz albums where a big drum and bass sound was required in order to capture the energy of the recording, but it didn’t detract too much from my overall experience. Rock generally fared quite well, although some of the sludgier stuff I’ve taken to listening to lately like Earth, Om, et al, lacked a little edge, not having quite the level of raw presence needed to raise goosebumps; but nearly always I found the sound to be clear with good definition and, to their credit, the little speakers always managed to maintain a high level of involvement. Older (New Zealand) pressings of ‘classic rock’ LPs like Led Zeppelin II and Tom Petty’s Damn The Torpedoes, which usually tend to sound a little thin and bright, actually sounded pretty good through the Revels, which seemed to be adept at dealing with any recording with an even hand and without being overly – if at all – analytical in terms of detail, transparency or recording/surface defects. Nick Cave and the Bad Seeds’ latest album Push The Sky Away is, in my opinion, one of the group’s finest albums in years. Subtle and restrained throughout, the music gracefully accompanies Cave’s distinctive vocals and lyrics with – unusually – barely an aggressive note to be heard. It’s a beautiful recording and a beautifully pressed piece of vinyl which deserves to be heard in a good system – and here the Revels did nothing to be embarrassed about. Listening to the album late one night with the lights out, I found myself drawn into the music, captivated as the sweet midrange and treble filled the room with every delicate note, with the dark poet himself floating like a crooning ghoul in between the speakers. When I turned the light on to turn the record over, I realised I’d forgotten what speakers I’d been listening, to and did a double take as it dawned on me that it was those little transducers which had just filled my room up with all that sound. If I really had to be critical of the sound, when I compared the M105s with my Spendors (SP2/3s), I noticed that at times the Revels could be ever so slightly veiled, as if they were holding back just that last degree of information – which could account for their easy going nature. I did also notice a hint of warmth which was quite obvious when comparing the Spendors, but not unpleasant. Returning to Basie Jam and ‘Hanging Out’, the brushes working the cymbals had a solid metallic shhshhshh sound when heard through the M105s, but when swapping back to the Spendors I could detect the whole movement of the brushes across the cymbals and the different (if subtle) tones therein. This is of course being ultra-critical and for the most part I thoroughly enjoyed – and was immensely impressed with – the performance of the Revels. If you only have the space for small standmounts but still want to be able to give the old trout next door a fright at two in the morning then you could do far worse than the Revel M105s. I would have to say that price is surely the biggest drawback here though; $2600 is a lot of cash for a small pair of speakers. If they were, say, an $1800 speaker, I would probably have given them a 5 star rating. Yet these are very good performing speakers which are generally unfussy about source material and would, I wager, be fairly unfussy about fitting into most hi-fi systems – provided of course there is a decent supply of current to feed them. The M105s have a big and un-fatiguing sound and although they’re a long way from being studio monitors, they have a nice level of detail retrieval and a smooth, rich sound which has the ability to absorb the listener in the music for hours on end – the most important factor in any hi-fi component, don’t you think? The acoustic-lens waveguide system certainly works in dispersing the sound, providing enjoyable listening for anyone not lucky enough to be parked in the listening spot. The Revels look good too, particularly in the Walnut finish, and are sure to find approval with significant others.